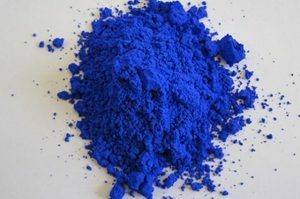 We in the department prefer to call it Mas Blue after our beloved Mas Subramanian, a fact that causes him some embarrassment. But we’re so proud of him and this serendipitous discovery. Due to the viral nature of the news lately, we’re compiling a list of all the news outlets where we’ve spotted mentions of this beautiful hue. Why chemistry? (What about it initially interested you? ): Chemistry is what makes life possible; every movement, every interaction and communication, every thought, every cure, every biomolecules comes down ultimately to atoms and bonds, i.e. chemistry. Research focus (in non-science terms) or basic job duties? As a chemist I find it fascinating to reveal the molecular players – the critical biomolecules and the chemical signatures – that are associated with the response of a biological system to diverse stimuli, exposure, chronic diseases and aging. We use mass spectrometry, a very sensitive analytical technique, to detect and identify the players. Knowing the players will in turn open avenues for designing therapies and promoting health. One thing you truly love about your job? Love the interaction with my students in the classroom and in the lab; there is nothing more rewarding if a student shows you what she/he developed or discovered and then starts to create her/his own story. Why chemistry? (What about it initially interested you? ): It was some courses I took in my first year at college. Freshman majors didn’t take general chemistry, instead I had one term each of biochemistry and crystallography. I was fascinated and a bit mystified, and they got me hooked into chemistry. Research focus (in non-science terms) or basic job duties? I’m looking into new intercalation chemistry reactions, and also at the preparation of new nanocomposites materials. These are interesting lately because they are the electrodes used in lithium-ion and related batteries. One thing you truly love about your job? One thing I love is discussing results from ongoing research projects. Getting results from new experiments means finding out unknown things about nature, and it really feels like being an explorer. One interesting/strange factoid about yourself. I worked for Stanley Kaplan (the man himself) for several years during college. Why chemistry? (What about it initially interested you? ): Not much interest in chemistry initially, particularly O chem. Only wanted to do laser spectroscopy because of the mathematics involved. Research focus (in non-science terms) or basic job duties? Develop a new technique to determine structures of macromolecules, and along the way, understanding fundamental properties of related physical processes. One interesting/strange factoid about yourself. I do not like and cannot stand watching any games on baseball or golf. A new chemical reaction between magnesium, zinc and CO2 that can be used to synthesise nanoporous graphene for supercapacitors. OSU-Cascades faculty members are working hard to bring science students more opportunities to apply concepts learned in the classroom. Using undergraduate students to conduct research is an up-and-coming trend at OSU-Cascades that has slowly garnered more funding opportunities over the past few years.